Acrylic Face Mounting – A modern elegant way to display your photos. The photo is mounted to the back of a UV resistant 6mm acrylic sheet, creating an airtight bond and letting you view the image through a crystal-clear glossy surface. This mounting process preserves the image from scratching and fading and creates a near 3-D stunning visual effect. It also gives the image more depth and colour saturation due to the clarity of the acrylic sheet. We back the image with a white 2mm Dibond to add rigidity and use an aluminium sub frame to float it from the wall. 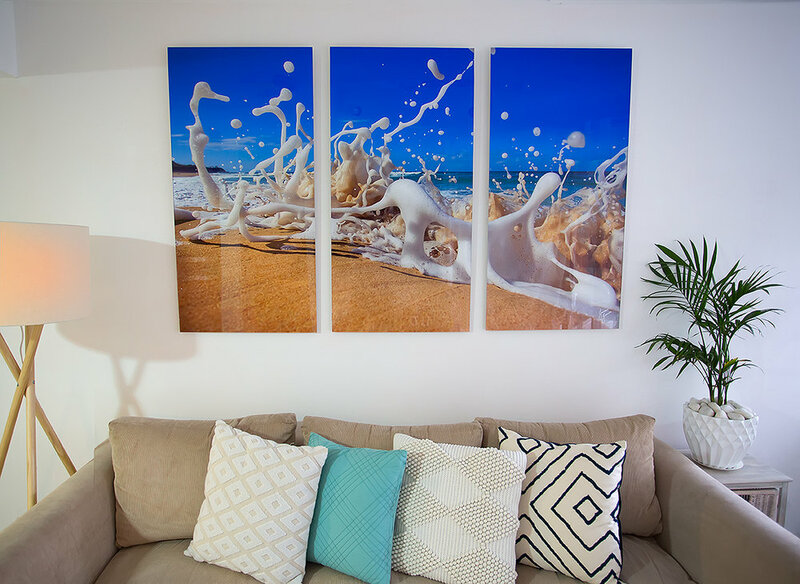 Acrylic mounted pictures create a big impression on your walls and the acrylic panel helps to enhance the photo by providing a super glossy finish. Modern, minimal and sleek - clean lines and cool fixings create a unique visual impact. Acrylic prints are robust and easy to clean, making them perfect for bars, restaurants, hotels and other public places, and especially your home walls. 6mm acrylic & 2mm dibond.